The 1978 season just may have been coach Bob Knight’s best coaching job of his distinguished career. In it he took a young and untried squad-eight of the 12 were either freshmen or sophomores, survived a 2-5 start in Big Ten play to win ten of the last 11 games-the last eight in a row- to zoom from ninth in the standings to tie for second and an at-large berth in the NCAA Tournament. The Hoosiers made it to the final round of 16 by downing Furman in the first-round but then were themselves upended by Vilanova by a single point in the East Regional, letting an 11-point lead escape in the second half which excessive fouls dictated a slowed down game pace. It was a great comeback after the 14-13 season of 1977, one in which excessive inexperience combined with a plague of injuries to blight the year. It was indication enough that the Hoosiers, who up to that time had won four consecutive Big Ten titles, won the 1976 national title, completed two consecutive undefeated regular seasons and were rated No. 1 those two years, are well on their way back to the heights. Those teams of the past hold the Big Ten record of 37 consecutive Conference victories, another of 34 over-all victories, and a span in which the Hoosiers won 67 of 68 games. The seven-year Knight era at Indiana has produced a 160-41 record, almost an 80 percent winning mark, and an 89-25 Big Ten record, good for more than 78 percent. He was chosen national coach-of-the-year in both 1975 and 1976 and in the six years the Big Ten has picked its coach-of-the-year, Knight has won it three times. In four NCAA Tournaments his team have won 11 of 13 games and in his 13 year career as head coach, ten of his team have won their way into tournament play. Only once in Knight’s seven-year tenure at Indiana have the Hoosiers failed to make a post-season tournament. Knight’s career record for 13 seasons is a dazzling 262-91. A basketball perfectionist, Knight has always schooled his teams to play aggressive, hardnosed defense. Three times his Army teams led the nation in defense and his teams always rank in the top 20. His game starts with defense as the great equalizer and the means to survive on the cold shooting nights everyone suffers at some time or another. Offensively his game is one of movement, both with and without the ball, all designed to produce the high-percentage shot. It is no accident that his Indiana teams have shattered all accuracy marks from the field. His theory is that athletes and teams play against their own ultimate potential more than against other athletes or teams. He sometimes can be as disturbed by a badly played victory as a well-played loss. A native of Orrville, Ohio, where he won ten letters in football, basketball and baseball, Knight is a 1962 graduate of Ohio State, where he was a member of Buckeye teams that won Big Ten titles in 1960-61 and the NCAA championship in 1960. Those teams, led by Jerry Lucas and John Havlicek, posted an overall record of 78-6. After graduation, Knight was an assistant at Cuyahoga Falls (O.) a year before entering the Army, where he was assigned to assist Coach Tates Locke at West Point. When Locke moved to Miami University in 1965, Knight, only 24 and still a private in the Army at the time, was named to succeed him. 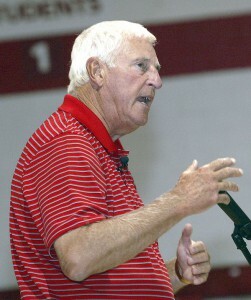 Bob Knight is a member of The Wayne County Sports Hall of Fame, inducted with the Charter Class of 1976.